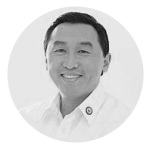 Arthur Cua Yap is one of the youngest to be appointed to the Cabinet of President Gloria Macapagal Arroyo in August 2004 as the Secretary of Department of Agriculture. He then left the post in July 2005 to give way to Sec. Panganiban and in December 2005, he became Presidential Adviser for Job Creation, then he became the 15th Director General of the Presidential Management Staff, it was the fifth post he has been designated to in the Arroyo administration, before being appointed again as Agriculture Secretary in 2006 up to present. He is the 32nd Agriculture Secretary as he holds this secretarial position for the second time. He first entered government service in August 2001 as President and CEO of the Philippine International Trading Corporation of the DTI. Thereafter, he served as the Administrator of the National Food Authority for two years and served as Agriculture Undersecretary for Luzon Operations, after which was a brief stint as the Secretary of the Department of Agriculture. The President also designated Sec. Yap as the Development Champion for the North Luzon Agribusiness Quadrangle (NLAQ). As such, he oversees and ensures the smooth implementation of NLAQ development projects. A lawyer by profession, Sec. Yap holds a Juris Doctor’s degree at the School of Law of the Ateneo de Manila University. He was also a Dean’s lister when he took up an A.B. Honors Degree in Management and Economics at the same university where he was fortunate to have had President Arroyo as his economics professor. Before his appointment as President and CEO of the Philippine International Trading Corporation (PITC), Sec. Yap was affiliated with the Yap, Jacinto, Jacob Law Office as Co-Founding Partner. He was also an associate lawyer of two more law firms namely: the Axucna, Yorac, Sarmiento, Arroyo & Chua Law Offices and the Balane, Barican, Cruz & Alampay Law Offices. He was once the National President of the Philippine Association of Paint Manufacturers.